Our soils can provide sustainable energy. Aquifer Thermal Energy Storage (ATES) is a smart way to re-use heat and cold in buildings and it is widely recognised as promising technology for sustainable energy. Global demand for heating and cooling in the built environment accounts for about 40% of total primary energy consumption. ATES is a simple way of meeting that demand by using the soil. The Climate-KIC project ‘Europe-wide Use of Sustainable Energy from aquifers’ – E-USE(aq) – is demonstrating how ATES systems can be implemented in several countries. It includes six pilot projects in five countries that will generate a flywheel effect for the introduction of ATES systems throughout Europe. Deltares is working on this project with a consortium of eight project partners and several other parties in Europe. Cooling buildings with a climate control system (air conditioning) produces heat that can be stored (using a heat exchanger) in an aquifer instead of being released to the atmosphere as with conventional air-conditioning systems; the soil isolates the stored energy like a thermos flask. The heated groundwater can be used in the winter to heat buildings. The water cools down as it releases heat. The resulting cold is stored separately in the winter so that it can be used effectively again in the summer, and so on. The system involves the creation of both a warm and a cold groundwater reservoir, enhancing efficiency. ATES uses electricity only for pumping the water around between the wells and for the heat pump needed to raise the temperatures to the required level. Even that electricity can be produced sustainably. The installation of 50,000 systems in Europe, which should be achievable in the next decade, could reduce annual CO2 emissions by approximately 3 million tons. ATES is much less visible than other sources of sustainable energy and it is therefore often overlooked. However, this lack of visibility is, of course, another benefit by comparison with wind turbines and solar panels, which are often seen as having a negative effect on nature and the built environment. The return on investment for ATES systems is sometimes just a few years and always much shorter than for other sources of sustainable energy. Given the subsurface of the country, the Netherlands is well adapted for ATES systems since suitable aquifers can be found almost everywhere. In addition, the Dutch government is actively encouraging the introduction of ATES systems and market parties are highly committed to the technology. 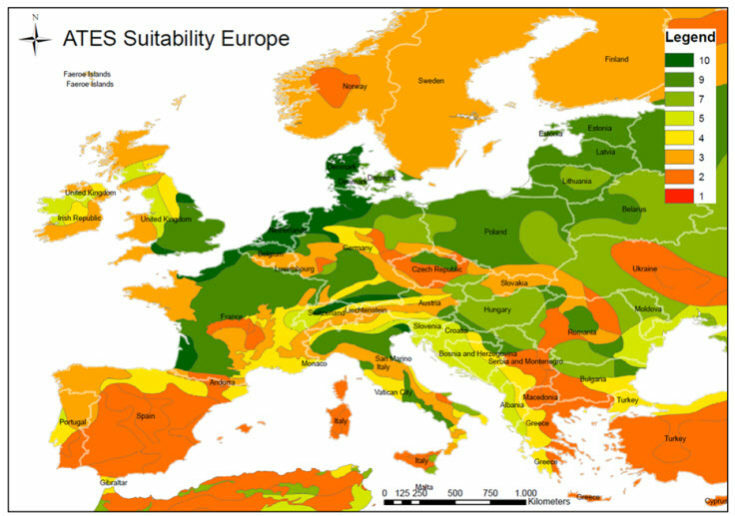 There is also major potential in other European countries given their subsurface structures (see map) and the obvious benefits in terms of cost and energy efficiency. However, levels of implementation outside the Netherlands are lagging. The reasons vary, depending on the country or region, from legal and regulatory difficulties to a lack of adequate knowledge and knowledge-sharing systems about the technology and the local subsurface. Installation and operation require knowledge and skills. When the appropriate skills are lacking, the systems are sometimes not installed correctly in terms of the soil stratification. That can result in, for example, clogging problems when water from a different layer is mixed in. Climate control above ground has to be compatible with the underground system and the involvement of different specialists is therefore needed. When there are failures due to problems with expertise, people may become wary about the technology itself. There is also a concern that ATES may cause groundwater contamination. However, this is not justified because the system only pumps groundwater around, even though ATES can contribute to contaminant migration if the groundwater is already contaminated. Furthermore, this drawback can be transformed into an advantage by using the ATES system for groundwater remediation. Similarly, other perceived threats can be turned into opportunities. In inner cities, for example, where adjoining systems can interfere with each other, smart planning – clustering cold and warm wells – can be used to improve efficiency. Optimal operation also requires a balance between heating and cooling over the year. Where there is an imbalance, one possible option can be a smart combination with cooled solar panels. 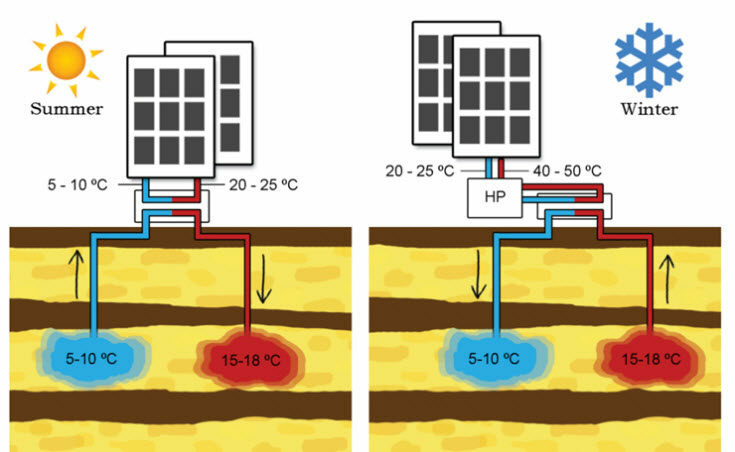 Cooling the panels improves the electricity yield and the heat produced can be stored in the subsurface and used later when it is needed. The E-USE(aq) project is demonstrating how ATES can be implemented in different European countries by showcasing innovative ATES systems tailored to local conditions at six demonstration sites in Italy, Spain, Denmark, Belgium and the Netherlands. These showcase projects show how the obstacles in each country or region can be overcome, paving the way for the Europe-wide implementation of ATES systems. The project results show that ATES is a renewable energy solution that is economically feasible, and also that social and legislative difficulties can be overcome with innovative technologies, bridging the gap between science and practice. EIT Climate-KIC is a European knowledge and innovation community working towards a prosperous, inclusive, climate-resilient society founded on a circular, zero-carbon economy. The convening power of EIT Climate-KIC allows it to identify and support transformational innovations that can lead to systemic change. Want to know more about renewable energy research?